The router comes with an app, which can be used to monitor and manage the device. 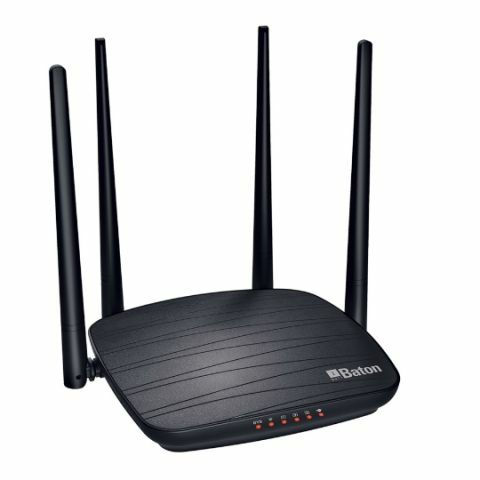 iBall has launched its latest Baton 1200M Smart Dual Band Wireless AC Router, which is priced at Rs 3,195. The dual-band router operates on both 2.4 GHz and 5 GHz spectrum and is said to offer data transmission rates of up to 1200Mbps. The device also supports beamforming and MU-MIMO technology. It is available for purchase from both online and offline stores. iBall, a brand known for its innovative and latest technology products, extends its networking solutions vertical with the launch of iBall Baton 1200M Smart Dual Band Wireless AC Router - the super smart and flexible router that operates on both 2.4 GHz and 5 GHz (Dual Band) along with a transmission speed of up to 1200 Mbps. Our latest phones and other gadgets like Tablets and Laptops now support 5GHz bandwidth. If you are using a router which is not supporting 5GHz speed, you are being unfair to the device’s capability and compromising on Internet speed and performance. It is time for you to switch immediately to a 5GHz router. Suitable for Homes and Offices, the powerful bandwidth of the router provides a large range, allowing more and new devices to join the network. Creating a high-speed wireless connection; users experience no more lagging. Equipped with the next generation Wi-Fi standard 802.11ac, 3 times faster than the ordinary wireless router, iBall Baton AC1200 Router delivers a transfer rate of up to 1200 Mbps. Bringing the blazing fast dual-band speed of up to 1200 Mbps, the router delivers faster Wifi speed for HD streaming, browsing, gaming and any of the high bandwidth intensive work. It supports both DSL and Broadband connections. Sporting 4 omnidirectional antennas, with the very unique MU-MIMO Technology, this Next Level of Technology shares the available bandwidth into separate individual streams equally to the connected wireless devices, as against one device at a time. Thus, this technology helps to improve Wi-Fi experience with better bandwidth performance and handle data more efficiently – stronger speed with better performance. Built-in with the latest Beamforming Technology, the router improves coverage by directing bandwidth to connected devices and delivers 360 degree. In other words, wherever you go, seamless network moves with you within the network area. In sync with the Mobile App i-Connect, the router can be managed remotely, anytime, anywhere. This further enables password protection, monitoring of online client devices, LED control, Remove Wake up among several others. With its unique guest network provision along with the access control for kids, it ensures good control over the router. Exploring the next generation of networking, the product is already available at both online and offline stores across India at just MRP of ₹3,195. Does Lenovo z2 plus support 4G at band 5? Anybody know the model number of sony headphones which they launched at prices them between Rs. 790-Rs. 2190 ? Best Wi-fi router within Rs.900/- ?